One morning Little Sister Rabbit hops out of her burrow to play. She’s having fun rolling about and picking flowers but something is not quite right. What is that odd smell? Is that the sound of a rumbling tummy? Could those be red eyes watching her? It’s a hungry fox cub! Little Sister Rabbit is too scared to move. Rabbits aren’t meant to be brave. Luckily, just before the fox eats her for his dinner, she realises just what to do. What are rabbits best at? Running foxes ragged! From the award-winning Swedish children’s author, Ulf Nilsson, and one of Europe’s best-loved illustrators, Eva Eriksson, comes this charmingly illustrated tale of bravery and trusting your instincts. 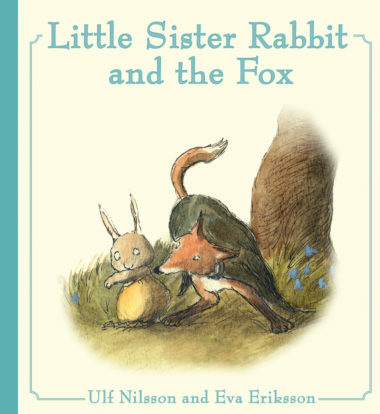 These classic Little Sister Rabbit stories are much-loved bestsellers in Sweden and can now be enjoyed by new generations in English. They are beautiful, hardback gift editions with a cloth spine.